First came Tic Tac where the current Ispahani Center stands that served up the Katti rolls, then came TIbbs, followed by Frankie which is found outside Nilgiris and near Fruit Shop on Greams road. And then I visited the Katti roll shop on RK Salai, near Tandoori Tadakka and finally this new one that has come in Wellington Plaza, Egmore [ the complex with Milky way and Donut House]. Called "Katti Kebab Company" owned by Mr Arjan Mahtani. It is located right at the end of the complex, behind Ponnuswamy Hotel and other places. A fairly large place, there isnt much ambiance. But as Mr Mahtani says, the food speaks for itself. When I was chatting with him, I learnt that he has lived nearly 20 yrs in New York and started this place about a month ago. He mentioned he has brought down guys from Calcutta when he set up this outlet. Another interesting trivia about him is that he also owns the Mainland China on Cenotaph road and is involved in Quiznos which is managed by his brother. The place is air-conditioned and there are a few chairs and a row of sofas to sit in. There is a small kitchen atop the small flight of stairs and that is where the rolls are created. There is also a fridge with aerated drinks and water and a bubble top as well. Simple ambiance, but when you pick up the menu card you are in for a surprise. 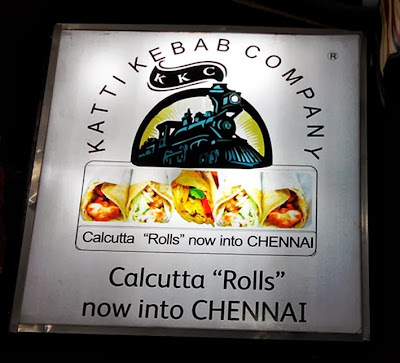 It is quite extensive, there are over 30 kinds of Katti rolls here, and quite a few options for Vegetarians as well and there is an entire section for Eggatarians. The 1st roll i opted for was the Paneer with Egg roll, it was delicious. Made with maida parotta, the filling was good, and it had a lovely touch of Black salt. The masala was not over the top and the heat factor was just right. You can choose low, medium or very spicy. Similarly, when you order a katti roll, you can choose either Maida or Wheat [Additional Rs10], and for egg, you can opt for egg white only[Additional Rs15]. The other thing I was totally fascinated by was that the rolls were NOT OILY at all.. There was no oozing oil, or that weird feeling in your mouth. Big Thumbs Up!! During the few hours we were there, I did try few other veg options- Plain aloo [ yummy], wheat roll with mix vegetables and egg, wheat roll with potato and channa [yumm], and palak paneer in maida parotta [ quite good, it had a strong aroma of lemon, but it wasnt strong in the filling] ..
A good place to grab lunch or maybe pick up few rolls if you are headed on a drive, or for a movie!! The price starts at Rs90 and goes on up to Rs150.. 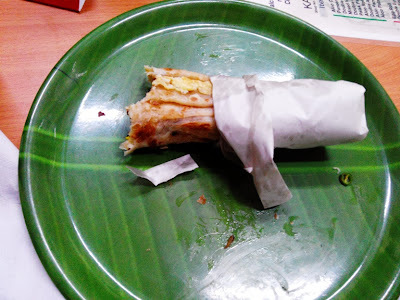 Neatly wrapped in white paper, these rolls are good even after a few minutes, it dint become chewy or dry.